NYU Arts and Science Alumni Blog: Meet the Executive Producer of Mob Wives, the President of WE tv, and More! , the President of WE tv, and More! 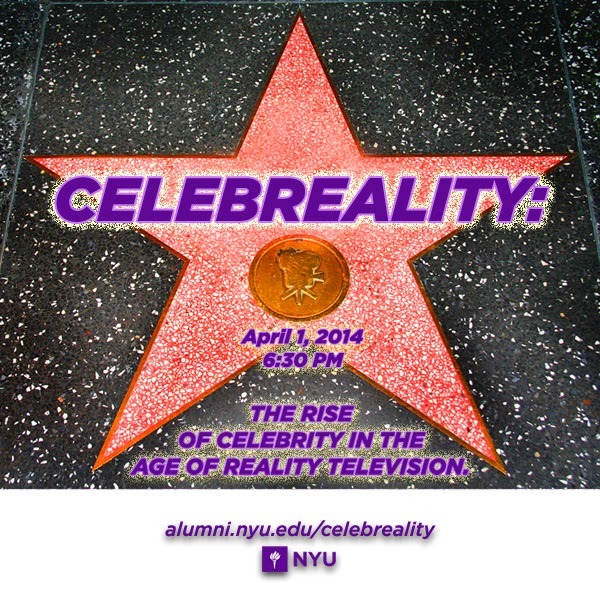 This Tuesday, April 1, the College Alumni Association is bringing you "CELEBREALITY: The Rise of Celebrity in the Age of Reality Television." From the Kardashian empire to the cast of Duck Dynasty, reality television has escaped the confines of just being regularly scheduled programming and has become a commanding force pervading every aspect of our daily lives – whether that be in the news, in our conversations, or in retail stores. This panel discussion will bring together NYU alumni and faculty from the television industry to discuss the evolution and prominence of reality television stars in our contemporary culture. JD Roberto (Tisch '92), Prime time reality TV host known for ABC’s How to Get the Guy and Fox’s American Idol Extra. The discussion will begin at 6:30 PM on Tuesday, April 1, and will be followed by a reception.